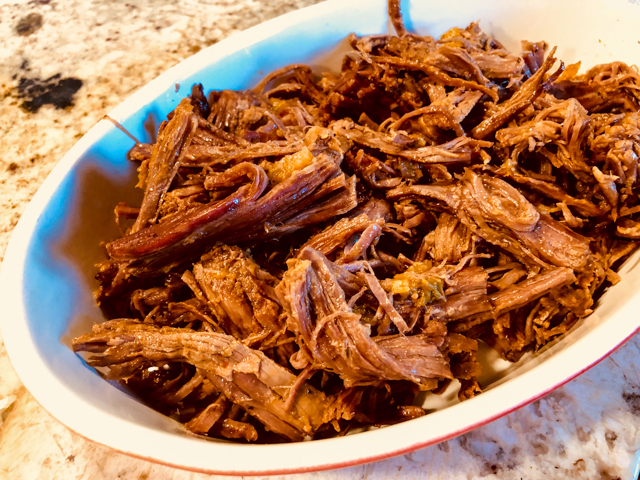 Carnitas are a favorite in our home… All you need is to place some over a tortilla, add a few toppings and call it a day. Those who prefer a low-carb path can grab a hearty leaf of Romaine lettuce instead of tortilla, and enjoy it while apologizing to the Taco Gods that will certainly frown upon such heresy. In this preparation, we put the pressure cooker to play, giving the flank steak a very pleasant texture. I’ve made it three times already, after seeing the original post from Kalyn. My recipe is a slight modification of hers, with a little additional step at the end. Heat the oil in the pressure cooker, add the minced shallot and cook 2-3 minutes or until fragrant. Add the ground cumin and chili powder and cook about a minute more. Cut the steak lengthwise and then again crosswise. Add the steak pieces to the pressure cooker with the red and green salsa, lock the lid in place, and cook at high pressure for 45 minutes. Shut down the burner and let the pan cool for 15 minutes, then do a quick release of steam under the kitchen faucet, and open the pan. Use a slotted spoon to scoop out the meat, leaving the sauce in the pressure cooker. Let the meat cool for a few minutes on the cutting board, then use two forks to shred the meat apart. Right before serving, place it on a non-stick skillet over medium-high heat and add small amounts of the sauce left behind in the pressure cooker. You can add as much liquid as you feel like it, but allow the pieces of meat to get a bit browned in the pan first. Use it to top tortillas with all your favorite additions, guacamole, shredded cheese, shredded avocado. Or enjoy it with white rice and beans. Comments: We are not big on cooking with ready-made sauces but make an exception to bottled salsas, because there are so many great brands out there. We love La Victoria, although it is not the easiest one to find. Leftovers go in mini-muffin pans straight to the freezer, and then inside a plastic bag. They do get a bit watery in the freezing-thawing process, but we mainly use them as addition to guacamole or stir-fries, so that’s not too serious a problem. Sometimes I defrost them over a small sieve, so that the excess water drips away. You can make the flank steak in the pressure cooker, in the instant-pot, or in a slow-cooker. Stop by Kalyn’s site to get specific instructions for each method. It is a great way to tame the fibrous texture of this meat, and give it a lot of spice without making it overly hot. I suppose you could go for a very hot salsa if you so desire… I’ve been in a more mellow phase lately. Such is life. FOUR YEARS AGO: Chestnut Brownies and a Blog Award! thank you… very tasty, and leftovers are soooo delicious! I love Kalyn’s recipes too. She tests and re-tests like you do to ensure we’re never disappointed. I wouldn’t have thought of using both red and green but this looks amazing! 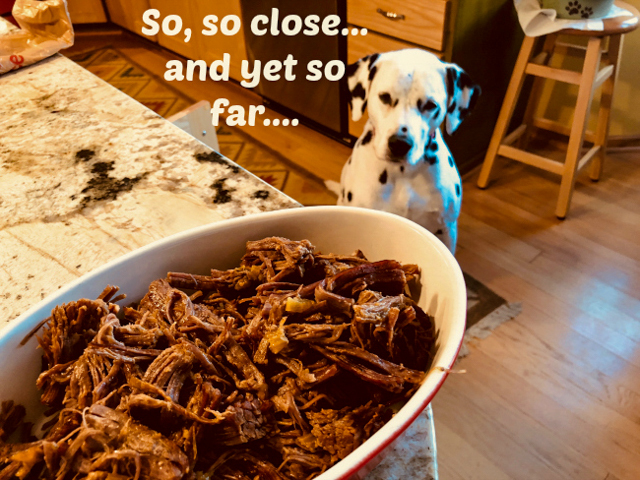 I never thought you could cook flank steak in a pressure cooker/slow cooker until I tried it myself. So good. This sounds delicious and easy peasy. P.S. La Victoria is plentiful out here. You need to come for a visit! 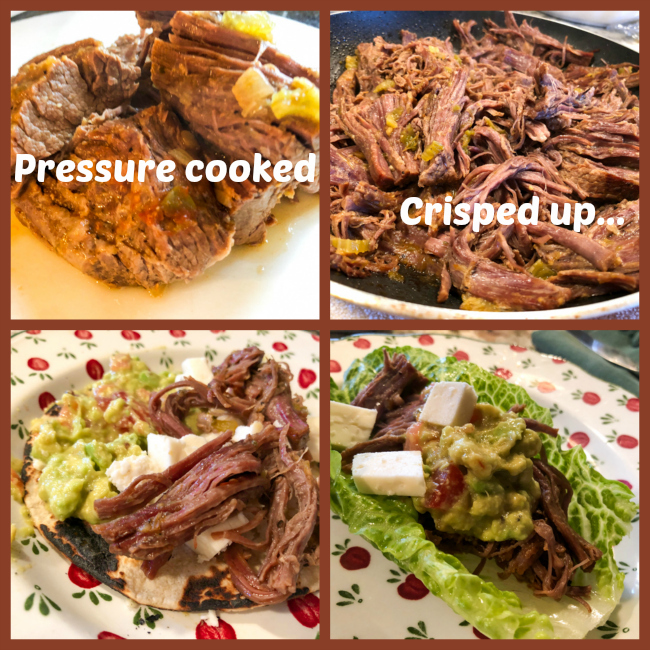 I love recipes that surprise me – flank steak and pressure cooker… who could tell?